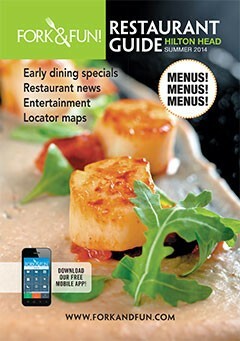 There are so many good restaurants on the Island and in Bluffton. Rather than try to keep up with them myself, I refer to Fork & Fun – a guide that’s kept up to date on a regular basis. Use the Fork & Fun website to find restaurant descriptions, contact information, locator maps and restaurant menus. Find Hilton Head early bird deals and the best happy hours on the island, restaurant menus and hours are subject to change without notice so be sure to call ahead.